• Do not keep objects except sunglasses inside the sunglass holder. Such objects can be thrown from the holder in the event of a sudden stop or an accident, possibly injuring the passengers in the vehicle. • Do not open the sunglass holder while the vehicle is moving. 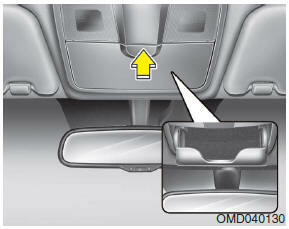 The rear view mirror of the vehicle can be blocked by an open sunglass holder.